Hiking is one of those experiences which can be heavily affected by the weather. Some people only venture out when the sun is shining whereas other will happily hike in the snow, wind or rain. Whatever your preference, getting the best rain pants are important to ensure that you stay dry whenever the bad weather strikes. Getting the best rain pants for hiking though isn’t as simple as it would seem as they are one area in hiking which has quite a few style and design differences. There are plenty of various features to consider but that’s where we come in, as we’ll give you all the information you need to know. Once you’ve read through this guide, you’ll be able to pick the perfect hiking pants for you. 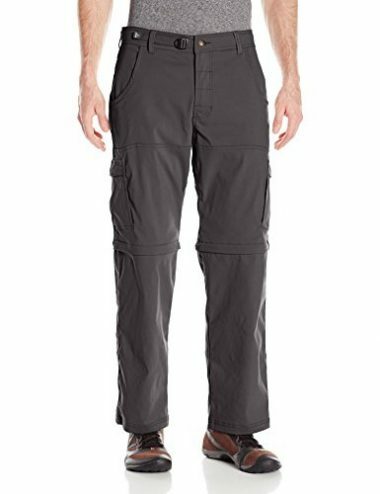 These are great pants which are not only great for hiking but work for many different activities too. The breathable rain pants are going to help to keep you cool in the sun but still allow your sweat to escape when it’s raining. A high level of comfort and warmth is provided by the product which comes from their comfortable material and the thermos-lined fleece interior. The zipped pockets give you security as does the reflective part of the pants. These are brilliant lightweight rain pants which come in a vast range of colors which means you’ll be able to find something which suits your style. They are highly durable pants with strong zippers and buttons to prevent any breaking. They are made with a duratex fabric which will be able to repel any liquid and dirt. There are eight different pocket options which give you plenty of storage for your essentials and the pants are also fade, shrink and wrinkle resistant. Columbia have produced these great durable rain pants which will be able to give you the strength you’re looking for in a variety of different situations. They are also available in a great range of colors too. If you start to get too hot in these pants then you would be able to take off the lower half of the legs and wear them as shorts. They are able to wick away moisture which will make sure that you remain comfortable in any conditions. These are very highly rated pants from Tru-Spec which are going to be highly comfortable as they have a self-adjusting slider waistband and also have a Teflon coating on the pants which is going to be able to give them stain resistance and durability. They have great pocket options which are going to be able to store all of your essentials, with two pockets that have internal magazine pockets which are great for storing your phone. The pants have reinforced knees to give it some extra durability. If you are going to be in more extreme conditions then these pants are going to be great for you as they will be able to give you a lot of protection from the weather as they are both waterproof and windproof, and they will also give you a lot of warmth too. They are made from a soft shell polyester material with an adjustable waist which is going to give you a high level of comfort. They have zippered front pockets for storage and a nice range of colors to suit your individual style. 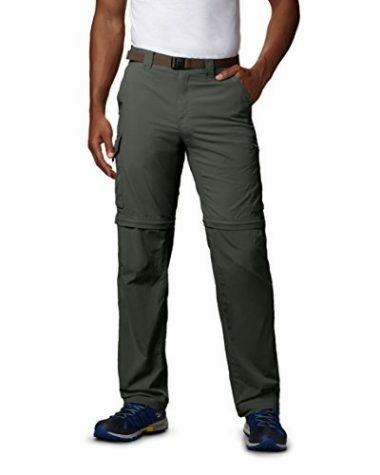 These pants are very easy to wear and will be great for hiking. They have a hook-and-loop ankle closure and an elastic waistband which has a shock cord adjustment to make sure that they are going to stay comfortable throughout the whole of your hike. They have zippered pockets so you are going to be able to secure your valuables with zippered legs to make sure you can easily take them off and put them on. They are going to be light and comfortable in your hike and help to keep you dry. 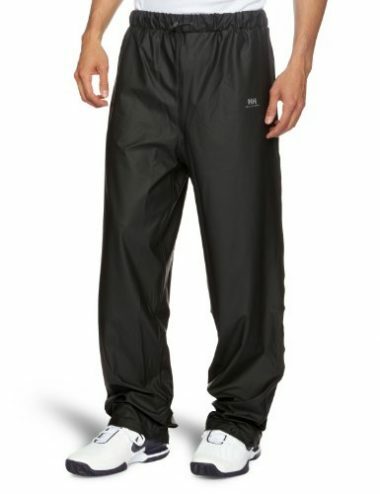 The rain pants reviews on this product are very good and it’s not hard to see why. They will feel very light when they are on but will still be able to give you a high level of comfort which gives you the best of both worlds. They are machine washable which adds to their ease of use and are a waterproof pant which is going to help to keep you dry at all times. They are highly adjustable which will be able to give you a lot of comfort. 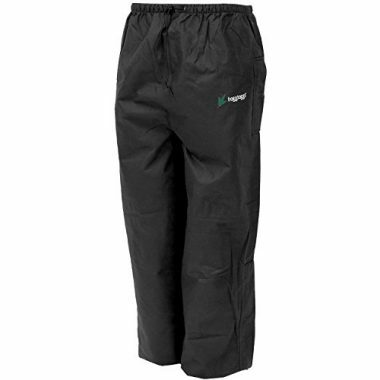 These are brilliant waterproof hiking pants from Helly Hansen which are going to help keep you dry for the duration of your hike with their polyurethane material. A few different color options are available which all look great. 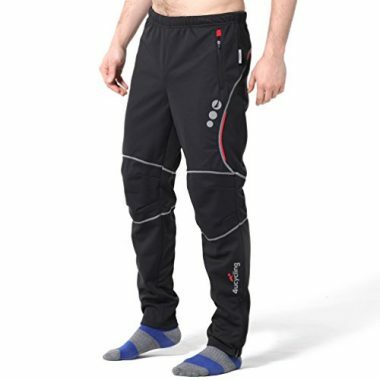 Helly Hansen are known for their quality products and it is no different with these pants. To go with their full weatherproof protection they also give you a full freedom of movement which adds to their ease of use. 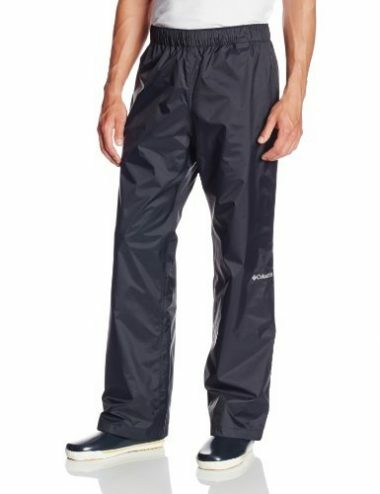 prAna have produced these top rated rain pants for hiking which are made from mostly nylon but also contain a little bit of spandex to give it that added comfort. The fabric is treated with durable water repellent which will ensure that they are water resistant. As well as having that water resistant they are also abrasion resistant which will help these pants last you for a very long time. They have a streamlined adjustable waistband which is going to be able to give you a high level of comfort with that durability. 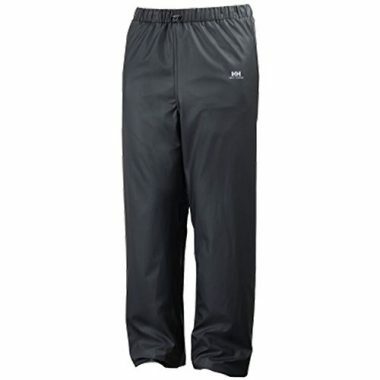 Helly Hansen have produced these brilliant ultralight rain pants which are perfect for hiking. They are made for women and are great for extreme weather as they are both waterproof and windproof. Even with that weather protection they have a full range of stretch which will give you a great level of comfort with their ease of movement. They have a quick drying lining and an elastic adjustable waist which adds to that comfort. The use that you are going to have for your pants plays an important role in the type of pants that you should be looking for. There are many different types of hiking experiences and they all require different elements. Sometimes you have to sacrifice one key feature in order for the pants to excel in another. If you are going to be going on a simple hike when the weather is good then you are not going to need much protection at all. You’d be able to pick pants which are simply going to be the most comfortable option for you. If you get caught in the rain then you know that you’re not going to have to be in your wet pants for long. If you are doing more extreme hiking though then your pants have to be able to excel in a number of key features. They would need to be able to be waterproof but also have a high amount of durability too while still remaining light and comfortable. This is where you should be looking at higher range products to ensure that you have this. In order to stay dry when you are out there hiking, you want to make sure that you have pants which are going to have the right amount of water resistance for you. This can be done with a number of different materials in a number of different ways, depending on other aspects such as how durable the pants need to be. There are fabrics such as Gore-Tex which work extremely well at being to be able to resist water while still allowing you pants to be breathable. There are other options where treatments are given to existing materials which are able to repel any water which they might come into contact with you. Here you have to think about what type of pants that you want for your hike and how that relates to the material. 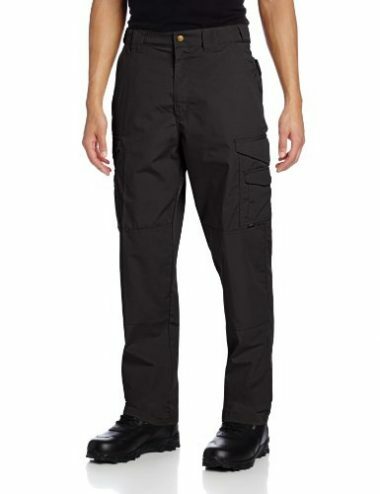 There are very light pants here which are very waterproof but wouldn’t give you much protection in terms of durability. On the flip side, there are pants with heavier materials which might not be able to offer the same waterproof protection but are more durable. As we alluded too there, pants may have different weights due to other aspects and it’s not a simple case of the lightest being the best. As is often the case with many different types of camping gear, there is often a compromise between one feature and another which in an ideal world you could have both but the reality is more complicated. The relationship between weight and durability is a great example as everyone would love pants that would never rip and be resistant to abrasions but there are reasons that everyone isn’t hiking in jeans. Equally, you want your pants to be as light as possible but then you might have to sacrifice other aspects. This is where you need to decide what features are going to be the most important to you and your situation. If you are hiking in the rain on flat ground, having light and waterproof pants would be ideal. Once you have found the type that you need, at that point you would be able to compare weights and see if there’s a difference. 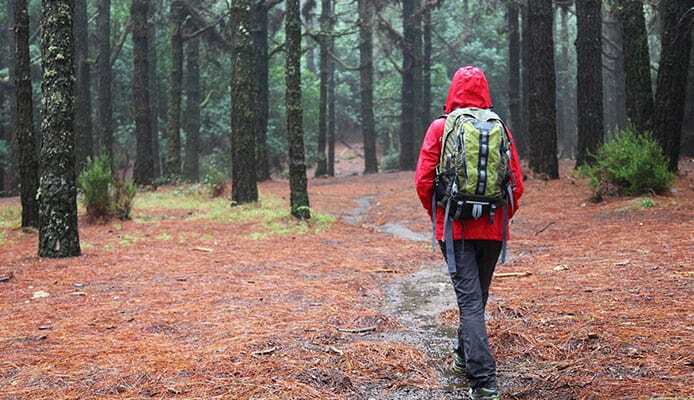 If you’re going to be out in the rain then you want to ensure that your clothing is going to be at least resistant to the rain so that you are able to hike in comfort and not have to worry about being soaked wet through. With waterproofing though there is a big difference between breathable and non-breathable fabrics. 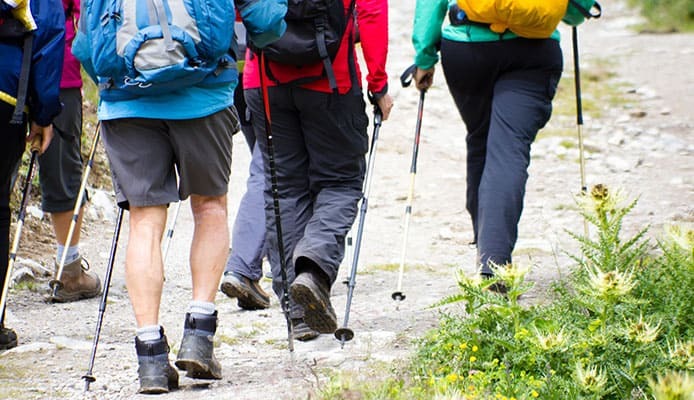 You want to ensure that your pants are going to be breathable as you might be in for an uncomfortable experience if they are not, especially if you are hiking in warmer weather. If your fabric isn’t breathable then the moisture coming off your body will have nowhere to go and will leave your legs wet, which makes the pants being waterproof irrelevant. When looking at waterproof fabrics, you want to look for the likes of Gore-Tex or fabrics which have a durable water repellent (DWR) treatment as these will allow the moisture to escape from your body but without any moisture from the rain getting in. If you are actively heading out in the rain, then getting waterproof pants are essential whereas if you just wanted to prepare for it, then having a water-resistant coating would be fine as your hardshell jacket would be able to provide most of the protection. It’s also worth considering how the fabric is going to be constructed. In this modern day and age, the world of textiles has improved incredibly and we have long seen materials which have a great blend of different features to ensure that you are able to get the advantages of each of them. Waterproof fabrics especially often have two or three different fabric layers to them so you are able to get the best of both worlds. Having an increased amount of layers will increase the overall weight of the product but often will provide you with a letter level of weather protection. The three-layered products that we often see are able to give you a high amount of durability and waterproofing and use the best materials to ensure that they remain light enough but are often on the more expensive end of the price scale. With these types of product, the seams become very important as you have to ensure that they are able to remain highly durable but also resist any water as seams are often a weak point when it comes to any type of clothing. They are a place where rips can often happen as well as water seeping into them. Waterproof clothing will have taped seams instead of more traditional methods. This is a glue which will be able to hold two separate of waterproof fabrics together. This is applied via heat and won’t let any water past it. Due to being heat applied, this is why you have to be very careful when washing and drying waterproof products. When buying rain pants for hiking it’s worth considering what other uses that you are going to be able to have for the product. In terms of other uses, some of these pants are stylish enough to be used as casual clothing when you are out and about which is a good way to make the most use out of them. Others are flexible enough to be used for more intense activities such as sports where having a waterproof pair of breathable pants could end up being useful. 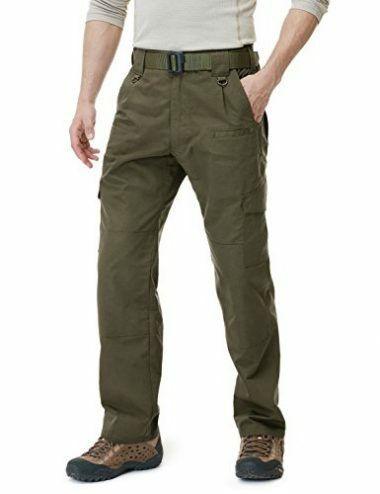 There are other great uses for these types of pants too such as hunting and fishing. In terms of hiking, one area of versatility which can be great is the ability to be able to convert your pants into shots when it’s a sunny day. Some products will have a zip just above the knees to allow you to get a lot more air to your legs and enjoy a more comfortable hike once the sun has come out. We have mentioned durability a few times in the previous sections and it is a feature which has a curious relationship with many different aspects when it comes to hiking, backpacking and camping. Durability usually means either extra material or more advanced material which means that you either add weight, cost or both. This is why you need to consider how durable your hiking pants need to be. All of the products that we have listed in this review have a good level of durability to a point but some are able to do it a lot more than others depending on what their primary use is. Having ripstop material to fabrics can be a food way to increase its durability without adding much weight and there are other materials which are naturally more durable but might be a bit weather. It’s also harder to waterproof tougher and more durable materials too. You need to balance all this out and work out just how durable you need your pants to be. The fit is naturally an important part of any clothing but especially for an activity such as hiking where you will want to make sure that you don’t have any part of your clothing rubbing or distracting you from what you want to do. Getting the right size is always going to be important and different companies often have different size options and little variances which make sit important to double-check before you decide to make your purchase. It’s always a good idea to see what others are saying about the product and to see if there are any annoyances about the way the product fits. On Amazon there is often a ‘fit as expected’ percentage which is usually a good guide as to whether or not a company have got their sizing’s right. There are a few key differences between cheap clothing and well-made clothing, especially when it comes to products such as this which are meant to give you weather protection. They can often be poorly made and often are too bulky. 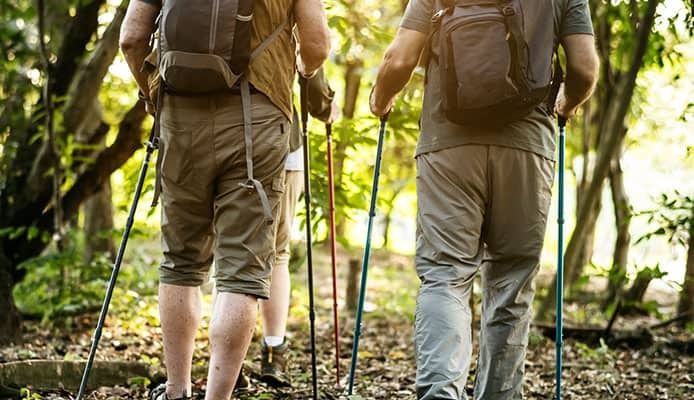 When you are out hiking you need to make sure that your range of mobility isn’t going to be affected so you are able to enjoy your hike without getting frustrated. Poorly made rain gear can often inhibit your movement and take away from your levels of comfort. This is another good reason to check user reviews as you will soon be able to see what people are saying about the product and how they perform in a real-life environment after being used multiple different times on various hikes. Q: What Are The Benefits Of Rain Pants? A: If you have ever been caught out in the rain when you are on a hike when not wearing rain pants, you will know just how uncomfortable they can be. That feeling of the material clinging to your skin can be very unpleasant. Added to that it can also cool your body temperature right down and make you very cold, very quickly, rain paints are able to prevent this. This will help to not just keep you dry and comfortable but they will also help to keep you warm as well. Q: What Are Rain Pants Made From? A: Rain pants can be made from a variety of different materials depending on just how much weather protection that you require. Nylon and polyester are very common materials when it comes to hiking as they are lightweight and durable but can also easily be made water-resistant. You will see other materials too, both in order to waterproof pants but also to make them elastic too so that they fit correctly. You just need to make sure that they give you the features that you are looking for out of your rain pants. Q: How To Wash Waterproof Pants? A: Due to the fact that these pants are often made out of a variety of different materials, it’s hard to say exactly how they should be washed but with any type of hiking gear, it’s always going to be preferable to hand wash them before anything else. Some hiking products are able to be machine washed, while others can’t, so it’s always important to check instructions before you do anything. Almost all products are unable to be placed in a dryer though as they can quickly get ruined that way. When you are out there hiking you want to ensure that you are going to be as comfortable as possible to ensure that you are enjoying yourself. As much as you want the best hiking boots or want to ensure that you are protected by your jacket, your pants also play a crucial role in that comfort. The best pants for you depend a lot on the conditions that you expect to be hiking in. If you are only in fair weather then you can focus on comfort but if you are happy to be in the rain then you want to make sure that you have protection. If you are actively going to head out in the rain then you will want to make sure that your pants are waterproof, and not just water resistant. Other aspects are important too as you want to make sure if they have other features which could be important to you such as their versatility and durability. You also want your pants to be flexible too so that they are going to be able to cope with the thousands of steps that you are going to be doing while hiking. Hopefully this guide has been able to give you all the information that you need to ensure that you are able to pick the perfect pants for you. Once you do, then you’ll be able to head out to your hike knowing that you’ll be protected from the weather and able to walk in comfort.